Carl Boyer, Director of Summer Recreation Program. -- label on back of photograph. 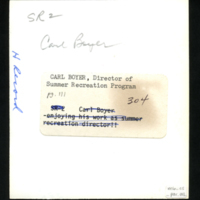 "July 1968 - Carl Boyer became Director of Summer Recreation for the city and continued each summer until the present (1986). 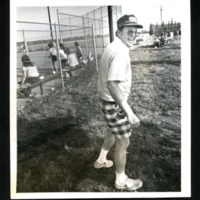 Mark Siebert wrote in the Hesston Record June 11, 1981, "The Ruler of Recreation, the Sultan of Summer Sports, the King of Kids Fun, or the Duke of the Diamonds, call him what you will but by any name Carl Boyer is hard at work again" (Bandy, 111). Bandy, Murray C., "Hesston Centennial 1886-1896", pg. 111.
unknown, “Carl Boyer,” Hesston Public Library, accessed April 25, 2019, https://hesston.digitalsckls.info/item/1438. 4.75 in x 4.75 in.